Yes, there’s a catch. 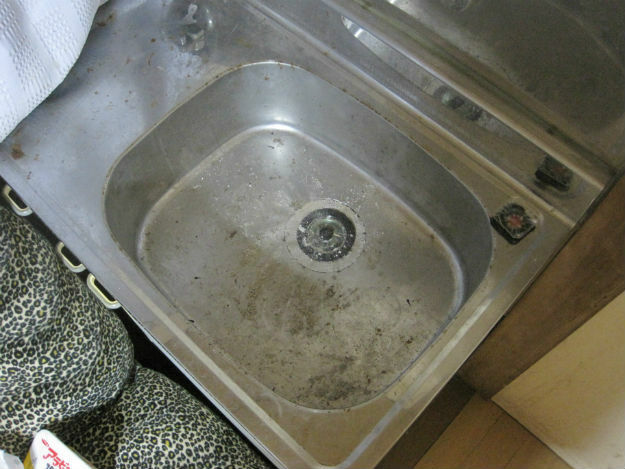 It’s incredibly filthy and it feels more like a halfway house than hostel. (Is it too late to write about what I ate for lunch?) I’ve stayed here many times over the years, I’m semi-ashamed to admit, and have written about it before. It might have been even worse before. 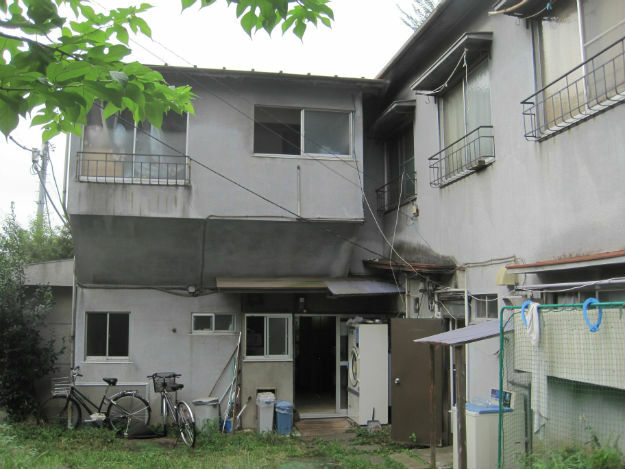 (The new phone number for the owner, Mr. Suzuki, is 080-5547-5824. I would explain how to call from abroad, but if it is the first place you see when you fly in, you will cry.) Back in the day it was a cool, insider place with a good mix of travelers and people living here, but now it’s all gone to seed. 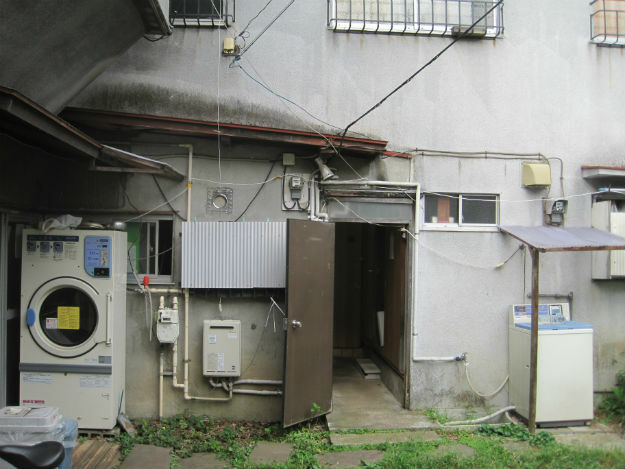 When I called Suzuki-san this time to see if there was space, I remembered to ask if there was a shower. Sometimes he doesn’t and you have to go to a sento (public bath) down the street. Alas, I forgot to ask if there was a free shower. 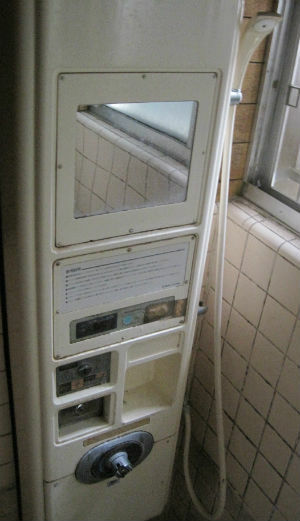 Now he has this coin-operated shower to the left, 100 yen for four minutes, or there is a free, much scuzzier, cold shower. Suzuki laying down the law! 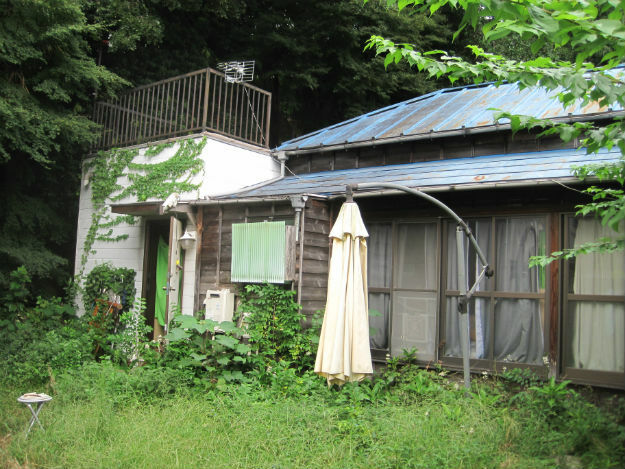 The white building is Suzuki’s cozy part of the estate. Architectural Digest has short-listed this for a feature. The zen garden. 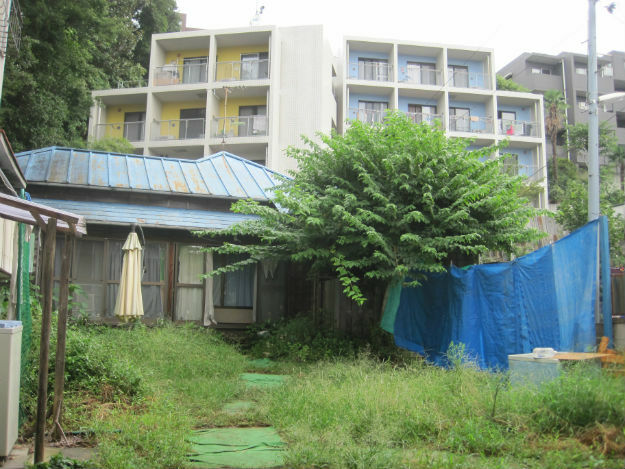 In the background is allegedly what his brother did with his half of the land: build modern apartments. I have no idea what business this can be for. Could be a bar, which are everywhere. When I was in China and I asked other travelers their favorite places, the males would say, “Chengdu,” and then follow with a quieter, almost conspiratorial voice, “and the women drink.” Women don’t drink all over China? It’s a funny thing to mention. If you want drinking women, look no farther than Japan. I can’t think I’ve ever met a Japanese woman who doesn’t drink—to excess, and proud of it. 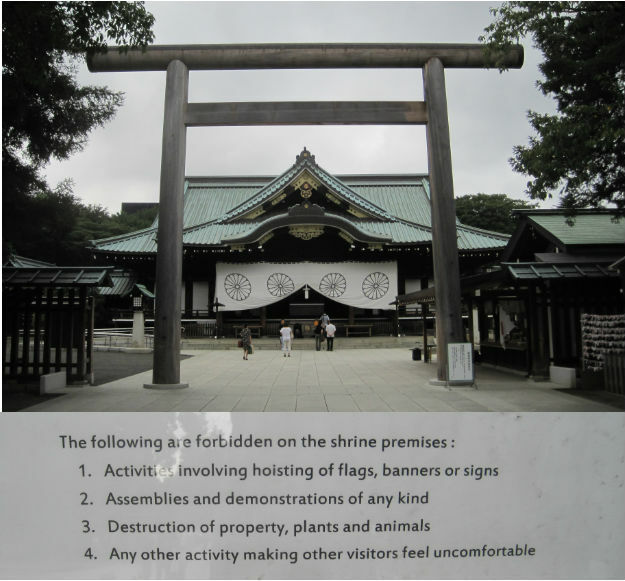 The funny thing about number 4 is that this is from Yasukuni Shrine where politicians visit to commemorate people who gave their lives to help build Japan, including convicted war criminals. It drives China and Korea nuts that they do this and every year it is a big kerfuffle. 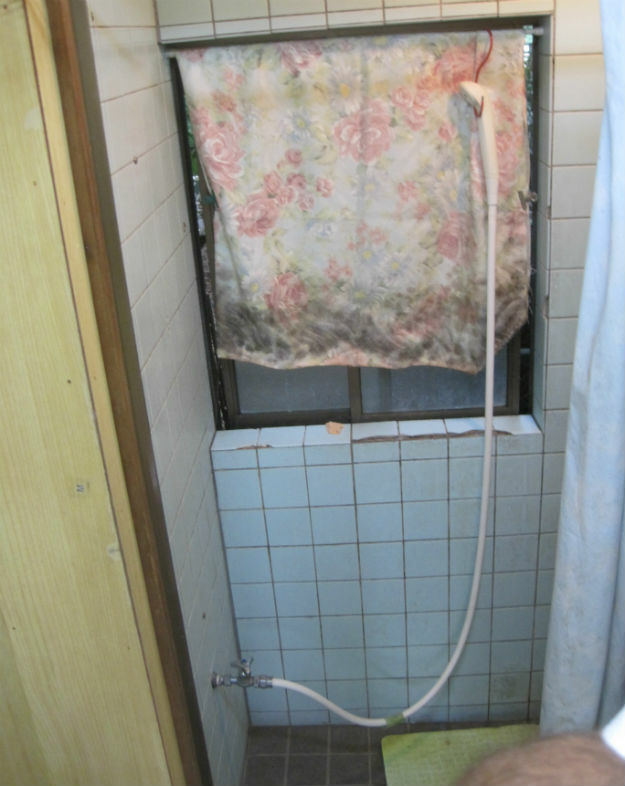 Love coin operated showers. Looks like a real gem. Phil, I will pay you not to stay there. You deserve better. I would totally read that book! I just found out I unintentionally gave myself a night in CAI on the way from the Emirates to Europe. Oops. I think the book would have 100 copies sold but shared on websites thousands of times. CAI airport is far from town, as you know, kimosabe. Haha, looks like a cozy place! I would definitely buy your book as I’m planning to come back soon! Where you heading next? Sab Sab, I am going to an archipelago called Philippines. Flavio, it is my special skill! It’s also probably why I will die young! Yay! I’ll be back in the Philippines by Nov/ Dec, gonna plan to stay 3 months. See you there, if you stay that long! Excellent question! I can’t believe I forgot to mention it. The answer is I don’t know, but I thought that since there is a coin shower, I didn’t think it was worth asking if there was wifi. Suzuki’s place deserves cinematic praise. You have of course, seen The Grudge? Anyhow, I shall wait for you here in the Philippines should you decide to shop for more toilet shots in my beautiful islands. No, I haven’t seen The Grudge. My CS host here is a horror film guy, too, and on the bus coming here there was a slasher movie. What is up with you Filipinos?